Regulation full size 32" x 48" x 3/4" slate. Plywood frame and rail construction. M.D.F. legs and aprons, metal apron and rail miter. Complete table weight 203 lbs. Shipped K.D. cabinet and slate separate, bumper posts and hole liners included. Cloth and accessories not included. This table is for someone who is looking to customize own bumper pool table. 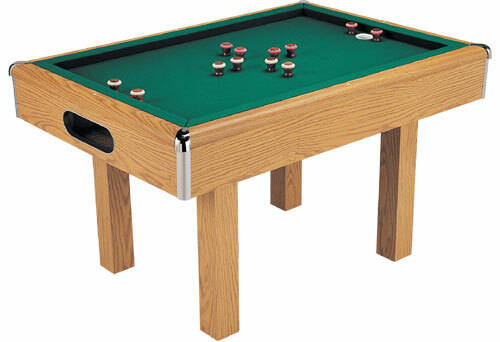 Get your favorite color cloth, pick the perfect length cue and balls and make one of the kind bumper pool table. (If you like fully assembled slate bumper pool table with accessories, check out our other slate bumper pool table).